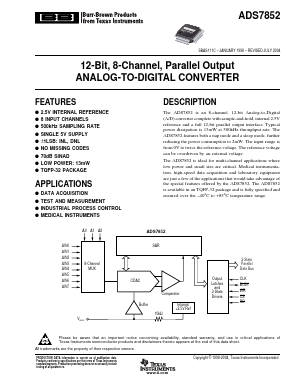 The ADS7852 is an 8-channel, 12-bit Analog-to-Digital (A/D) converter complete with sample-and-hold, internal 2.5V reference and a full 12-bit parallel output interface. Typical power dissipation is 13mW at 500kHz throughput rate. The ADS7852 features both a nap mode and a sleep mode, further reducing the power consumption to 2mW. The input range is from 0V to twice the reference voltage. The reference voltage can be overdriven by an external voltage.